I watched this on Friday evening. Anyway, I thought this episode was more in keeping with the spirit of the Terry years and I enjoyed it. Loved the scene when Dave, when telling Arthur he was being chased by the man from the Customs and Excise, asked Arthur if we would not just be better paying what he was due, Arthur was wounded badly at that suggestion. I think it would have been good if Ray had managed to get a fight in somewhere, I think a good old ruck would have benefited the episode and with the changing times he didn't bed Nelsons wife either, the times certainly were a changing, no wonder poor Terry left. A good episode. Series Eight seems to be getting better towards the end. Arthur reselling playing cards totally suits the character. He is a man always in search of an easy earner. I agree that series 8 dips and improves towards the end. I like this one as it has a real 90s evening vibe and I liked the dodgy playing cards angle. Indeeed a very good episode. This is a fun episode. I love the bit where Arthur thinks he is having posh lunch and gets a terrible looking fry up! Almost as bad a Vern's fry up with the "truffles" on top. Lorna is very nice too. In real life the actress, Hetty Baynes, was married to Ken Russell! The scene where Arthur explaining to Lewis about Lorna waiting inside the casino for him "powdering her nose" is classic GC. Also Eric trying to be the hard man and whacking the VAT man with a pot plant is gold, as is Ray explaining it to Arthur at the end! A classic episode. I could watch this one over and over. The lady (Hetty Baynes) who Ray has to mind looks familiar but I can't place her. I thought it was a refreshing take on the casino culture back then. Really made me laugh how Arthur Daley was really getting into the game towards the end and I thought the ending was fitting. Was it me or did Arthur Daley not get caught out towards the end when he was spotted? I thought that was funny how he got away with not being caught or something with what he had. Having watched this episode on Tuesday, it is IMHO one of the best Ray Daley outings I've seen. As mentioned above, it does in some ways hark back to the Dennis years, and it's a complete hoot. How it veers from greasy caff to roulette wheel is inspiring, if a little far fetched. 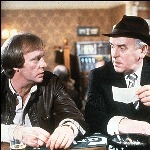 For me, that's what made Minder superb in the first place: Fun but not too OTT. Oh, and Hetty Baynes looks yummy. I really enjoyed Arthur's sales pitch on the plants at the beginning of the episode. Great episode but I could not of seen Terry lowering himself to make up the playing card sets!